Us Ending Explained: Is a Sequel Possible? Jordan Peele's Us is in theaters and we need to talk about that ending. And also touch on whether or not a sequel could happen down the line. This serves as Peele's sophomore directorial effort following his breakout hit Get Out, which earned him a Best Original Screenplay Oscar and did huge business at the box office. With Us, Peele has crafted a decidedly different movie and one that we're going to be talking about and dissecting for years to come. But for now, let's do our best to break down that ending. Warning: massive spoilers ahead for Us. Seriously, those who haven't seen the movie would do well to turn back now. That out of the way, let's dig in, but with one big caveat. I will do my personal best to break this one down, but this is a very complex, layered movie. Jordan Peele really outdid himself on this one and there is so much to think about, dissect and discover. But, in the most base-level manner, I will try and explain what happened in that absolutely insane ending. We can leave some of the deeper meaning and theme conversations for a later date once we've had time to digest this movie properly. Heading into the third act, we discover that this is not an isolated incident. It's not just a couple of families that are dealing with this awfulness. There are thousands, if not possibly millions (more on that later) of these doppelgangers, who are identified as "The Tethered," that have made their way to the streets and are killing innocent people everywhere. Adelaide (Lupita Nyong'O) and her family decide to go on the run and make a break for Mexico, or anywhere, to get away from the madness after narrowly surviving their encounters with these bloodthirsty clones up to that point. After driving through the night, they eventually come upon a flaming car in the middle of the road, which was a trap set by Red, Adelaide's doppelganger, and Pluto, the creepy counterpart to Jason (Evan Alex). This leads to Jason being taken by Red, after a pretty stunning visual sequence, which leaves Adelaide no choice but to follow in the hopes of saving her son. 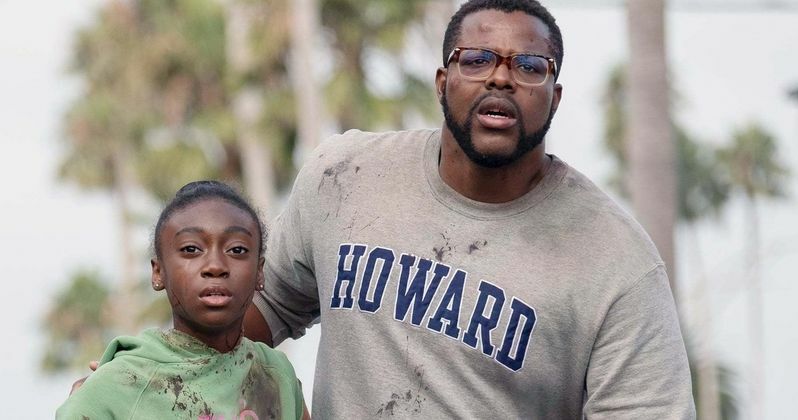 Gabe (Winston Duke) and Zora (Shahadi Wright Joseph) stay behind and try to find safety. Adelaide ends up having to go into the same house of mirrors she did as a child. She discovers an entire labyrinth of rooms and rabbits deep beneath the surface that housed The Tethered before they organized this assault on the people. Eventually, Adelaide meets up with Red and they have a very tense, verbal confrontation, in which, Red explains how this whole thing came to be. Essentially, a government agency of some sort, that is never seen or identified, tried to create these clones in an attempt to control the human population decades ago. Unfortunately, that didn't work out because they couldn't clone the "soul." That element of their likeness ended up being shared by both the human on the surface and their Tethered equivalent. Those who created The Tethered eventually abandoned them once they figured out they were, more or less, useless because of this soul sharing business. What we learned at the beginning of the movie is there are literally thousands of miles of unused tunnels underneath the U.S., many of which don't have a known purpose. As we come to understand, their purpose was to house these creations. Without leadership, they were left to their own, horrific devices beneath the surface for years. But Red was special. Smart. Different. She organized an uprising, which took years to plan. We come to find out that Red became the leader of The Tethered, following her fateful meeting with Adelaide all those years ago, which also explains why Red is so special (more on that in a moment). This leads to an epic confrontation between Adelaide and Red, who fight it out until the bitter end in another stunning sequence. Eventually, Red meets her end, in particularly brutal fashion. Jason is saved. They return to the surface world and reunite with Gabe and Zora. All seems well. Ish. But looks can be deceiving. The real shocker here is that we come to find out, in those 15 minutes that Adelaide disappeared from her family years ago, a lot happened. Red, or who we thought was Red, switched places with Adelaide, leaving her trapped in the world below to live amongst The Tethered. That's why Adelaide, who was actually Red, was so different upon her return and couldn't talk. It's also why Adelaide, who we thought was Red (confusing, yes), was able to assert herself as a leader of The Tethered. Additionally, it explains why Red was the only one who could talk, because she was actually a normal, human girl before all of this happened. It also explains her extreme bitterness and lack of ability to accept her situation. She was a normal girl with a relatively normal life before that fateful day. So, what we're left with is a scenario where someone who was originally one of The Tethered survives the ordeal with her family, and a poor girl who got lost as a child was killed after leading a bloody uprising the likes of which the world has never seen. The final shot reveals thousands and thousands of The Tethered linking hands across the landscape, mimicking Hands Across America and showcasing the shocking death toll. We're left to question, what happens to them now? As for the Hands Across America significance? At the base level, it was one of the last things Adelaide saw before being swapped with Red, so she would naturally use it as a touchstone for this bloody uprising. We also don't really know whether or not The Tethered were just located in Santa Cruz, or if they were spread all across the country. That's a lingering question, to be certain. It does leave things open ended, just enough, to possibly leave room for a sequel down the line. There are enough questions to answer that could fuel a sequel story, but is that something Jordan Peele would actually want to do? For his part, Jordan Peele has expressed his openness for a Get Out sequel, so why not Us? Undoubtedly, Peele would have a lot to say about it himself. And he'll surely talk about it in the coming months. Again, we could talk about this for hours and for an exhaustive number of words that would venture into the thousands but, for now, that's what happened. Us is in theaters now from Universal Pictures. Will Dumbo Fly Past Us at the Weekend Box Office?